Whenever I leave the house, I take a pair of sunglasses with me. I couldn't live without them, because it's constantly too bright for my eyes. 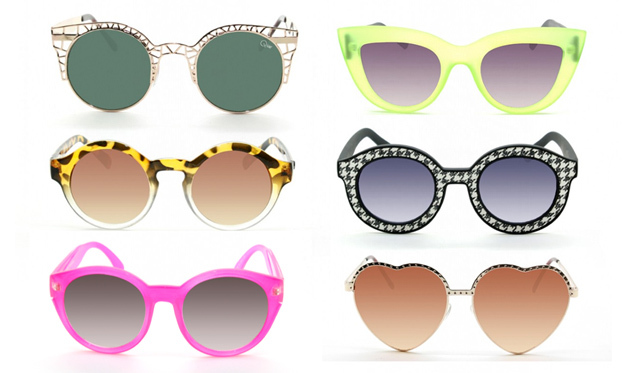 The ability of sunglasses to completely change the appearance of the wearer, makes them the perfect accessory. Quay Eyeware is the Australian sunglass brand by Linda and Allen Hammond. The brand was born on the festival circuit by the music loving duo. What started as a small project soon grew and nowadays their glasses are retailed by Nastygal, Nordstrom and Asos, besides being sold by various Australian retailers and of course on their own homepage. Celebrities like Gwen Stefani, Diane Kruger and Whitney Port are regularly spotted with a pair of Quay Eyeware sunnies. Isn't it great to wear the same glasses like style icon Gwen Stefani? All the shades are about 40$, definitely not a big prize for an ultra-stylish accessory, so what are you waiting for? Visit Quay Eyeware on their page or join them on Facebook. All pictures used with the permission of Quay Eyeware. Find ich genial, genau so wie deinen Netzpullover. Wow, wie geil sind diese Sonnenbrillen? !